It may be because my tween will be getting a phone in the next few months, but I have been drawn to books about cyberbullying. This book is fascinating because it also tackles issues of self esteem, depression and attempted suicide. These are subjects we should be discussing with our kids, and while it is not always easy, sometimes a book is a wonderful starting point. This book was well done and provides a perspective of how these issues affect all the kids in a family. Don’t forget to Follow One Great Book on Facebook, Twitter, Pinterest or by email so that you don’t miss a single post that will help kids navigate social media, a world all too unknown to parents. This book is about Lara, who develops a crush on a boy she has communicated with through Facebook but has never met. When he dumps her in a very public and humiliating manner she is so hurt that she tries to take her own life. The way this affects both her and the people around her is incredibly powerful and the story is told from Lara’s perspective, the perspective of her sister, Lara’s “used to be” best friend Bree from next store and Bree’s brother as they grapple with their own families and challenges. No matter how many times we tell our kids about the power of the internet and the potentially negative effects of how they use social media, they still seem to think we are just a little bit out of touch. This book is a good reminder that their actions can come back to haunt them. This book looks at both the effects on the teen being bullied and the teen doing the bullying. It is nice to get a look at both perspectives since nothing happens in a vacuum. The multiple perspectives kept this book moving quickly and I found myself not wanting to put it down. It was absolutely fascinating to get insight into all the characters’ thoughts. Great for kids as a cautionary tale about social media without feeling preachy. It is an engaging story. It reminds me of books like Unfriended and Katie Friedman Gives Up Texting which give kids a good perspective of what can happen when social media goes wrong. While a weighty subject, it is not one parents should shy away from. Depression and cyberbullying is something every parent should be discussing with their kids and this book is good way to start the dialogue. 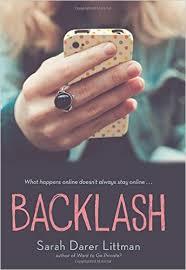 Click on the following link to connect to Amazon: Backlash. A portion of each purchase will go to support this blog at no cost to you. Thank you for your support.